I quoted that poem, above, in my original blog review of The Happening (2008) some seven years ago. Much like Roger Ebert at the time, I enjoyed this M. Night Shyamalan film on my theatrical viewing. I found it surprisingly gory and nihilistic and also refreshingly off-beat in a season that brought us a lot of CGI superhero movies. It was only as the weeks, months, and years passed that the film’s reputation as a laughingstock took on a breathing, pulsing life of its own. The Happening was widely pilloried, mocked, and dismissed. Today, it exists as a wonderful punch-line: a movie so "bad" that one can't possibly defend it. Mark Wahlberg as a science teacher? Scared humans attempting to out-run the wind? Plants communicating with people? For those seeking to take down the film and its director, M. Night Shyamalan, there is plenty of ammunition here by which to accomplish that task. Many folks have availed themselves of it. 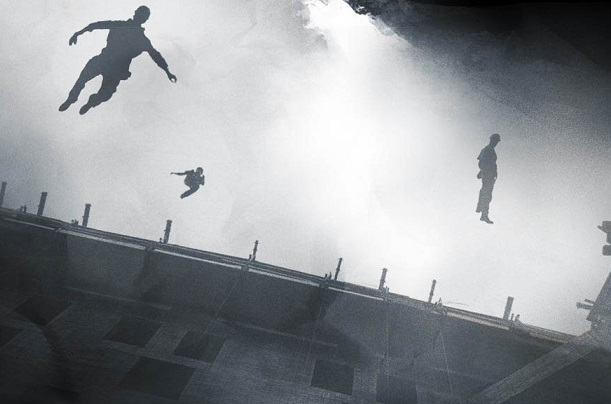 Specifically, there are three qualities that help me register The Happening as a promising film, even a worthwhile one, in the face of all the steaming piles of negative criticism. A few moments near the start of the film are actually down-right vicious, and represent an out-and-out horror sensibility that we have not really seen from this director before, even in The Sixth Sense (1999). I certainly wouldn’t mind if Shyamalan returned to this darker, grimmer brand of filmmaking in The Visit, staging gory deaths with relish and even going for some dark gallows humor. Secondly, as much as viewers and critics guffawed over the idea of people communicating with plants and plants emitting deadly neuro-toxins, there is, actually, a basis for fact in some of these ideas, and I enjoy how Shyamalan utilizes the concepts to tell his story of man's denialism. Basically, plants get fed up and reject humans, deciding that our “sprawl” on the planet is now a mortal threat to their survival. So the movie qualifies, perhaps, as the strangest revenge of nature film ever made. I enjoy revenge of nature movies, especially those of the 1970s -- like William Girdler's Day of the Animals (1977) -- and The Happening is undoubtedly a call-back; Day of the Trees, or Day of the Plants. It’s not as if there are no genre antecedents or precedents for what Shyamalan has wrought here. He’s not “out of line” with traditional sci-fi thinking, as so many critics seem to believe. On the contrary, his film fits into a tradition of some great revenge of nature films (The Birds), some effective ones (Kingdom of the Spiders) and some terrible ones (Night of the Lepus). Thirdly, we must return to the wise Mr Ebert’s comment about The Happening weaving a spell. There are moments in the film -- particularly the nasty ones -- that are downright mesmerizing, even trance-like in presentation. Even in vetting what some viewers obviously consider a poorly-conceived film or narrative, Shyamalan is impressive in his compositions and staging. There’s a fatalistic waiting-for-the-other-shoe-(or body…)-to-drop aspect of some death scenes here that prove nothing less than chilling. Of course, there are the deficits to describe too. The primary of which -- nothing personal intended -- involves casting. Mark Wahlberg and Zooey Deschanel, as a couple, are a big step down from Bruce Willis and Olivia Williams in The Sixth Sense, Bruce Willis and Robin Wright in Unbreakable, and Bryce Dallas Howard and Joaquin Phoenix in The Village. By comparison, their characters -- Eliot and Alma Moore -- come across as superficial and silly. Wahlberg can be a remarkable screen presence (see: Dirk Diggler in Boogie Nights , or The Departed), but he typically doesn’t do well with genre material (see: Planet of the Apes ) that requires him to come across as a deep thinker. I’m not saying the guy is stupid. He wouldn’t be where he is right now -- an international star -- if that were the case. I’m only suggesting that Wahlberg doesn’t typically project intelligence (or more accurately, intellect...) in a way that I find convincing or believable. Deschanel also seems grievously miscast, too young, big-eyed, callow and distant to be a successful repository for audience identification. In a way, The Happening reveals how deeply M. Night Shyamalan relies on good actors to transmit his spiritual, humanistic narratives. Bruce Willis, Mel Gibson, Bryce Dallas Howard, Samuel L. Jackson, and Paul Giamatti all bring their “A” game to his films, and their presence lifts the material. I can’t, in honesty, claim that Wahlberg and Deschanel accomplish the same feat. As casting falls under the director’s purview, I am not letting Shyamalan off the hook here, or looking to cast blame on someone else. I’m just noting that the film’s characters never reach the level of reality or familiarity that they ought to; and that Shyamalan’s characters achieve in other films. A lot of people will tell you that The Happening is a full-fledged disaster and that it represents the final death of Shyamalan’s career, with later films The Last Airbender (2011) and After Earth (2013) simply kicking the corpse a few more times. As you might expect, I disagree. 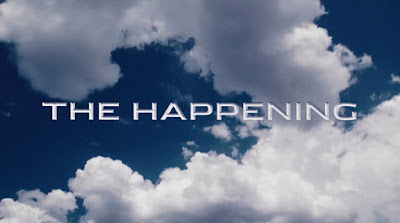 Although The Happening doesn’t feature to a significant degree the themes of Shyamalan’s earlier works -- a character discovering his or her destiny, and a commentary on the nature of storytelling -- the film’s deficits have nonetheless been exaggerated to a ludicrous degree. There are aspects of the film that succeed, even if, I would have to agree that The Happening is, perhaps, the least pleasing and least artistically successful of Shyamalan’s projects. Still, I can’t bring myself to hate it, or dismiss it out of hand. I still see beauty and creativity in aspects of it. And when I go back and read the extremely hostile reviews, I don’t necessarily blame Shyamalan for trying something unique and falling short. A high-school science teacher Eliot Moore (Mark Wahlberg) who is estranged from his wife, Alma (Zooey Deschanel), learns at school of a strange happening on the East coast. As this strange happening spreads, the couple flees Philadelphia with a math teacher and friend, Julian (John Leguizamo) and his young daughter. Then the “attack” strikes their city, and they evacuate on a train. Julian heads to Princeton to find his missing wife, and doesn't survive the trip. The others continue to flee, to ever smaller population circles, as the entire North East is decimated by an attack that seems to be carried on the wind, but which originates not with foreign fighters...but with Mother Nature; with plants. Who would have guessed that the world would end with a whimper instead of a bang? That's just one intriguing idea you may reckon with if you take The Happening on its own terms. Doomsday comes for man not with tanks or nukes, but at the hand of something he takes for granted: Mother Nature. In The Happening, man's destruction -- his destiny -- is carried like a whisper on the wind. After we see turbulent clouds roiling in the sky, people begin to behave strangely in Central Park. They stop, confused, acted upon some unseen force, and begin to kill themselves in horribly violent ways. One woman on a park bench stabs herself with a hair-pin. 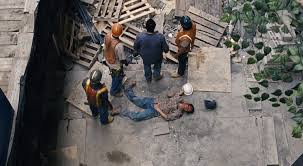 Later, at a construction site, bodies fall from skyscrapers in a sudden deluge. The ghoulish punctuation of this death scene involves the passage of a hand-gun from person to person, used in one suicide, then another, then another. Shyamalan’s camera stays trained on the gun, not the final bloody act, as shots punctuate the soundtrack and bodies crumple. Despise The Happening to your heart's content, but these opening sequences are brilliantly orchestrated, revealing to the audience how reason, and indeed self-preservation, no longer matters to those affected by the neurotoxin. Again, it’s worthwhile to note that Shyamalan has never been so nasty in his imaginings before, tossing characters off ledges, and staging execution/suicides like some wicked game of musical chairs. A later scene in the film is just as ghoulish, and dark. It depicts scared survivors of the "happening" using heavy weaponry to blow away two innocent children who happen to be knocking on their front door. Rather than help these kids, the unseen murderers resort quickly to bloody violence, and again, Shyamalan doesn’t shy away from the gore, or the horror of the scenario. In this case, the point is clearly that man faces problems besides having his “self-preservation” mechanism flipped by a neurotoxin. Some humans are also clearly impacted by another devastating "plague" - lack of a necessary conscience, a lack of empathy for others. Who could murder kids at point blank range? Again, we must ponder that no other film of Shyamalan seems so hopeless about humanity. The horror scenes in The Happening work just fine, and, indeed, are necessary. Plants and toxins carried on the wind are not suitable villains, really, in terms of visualization. They can’t walk or talk. They can’t shoot or stab people. So Shyamalan goes whole hog into the self-inflicted and human-against-huan violence to showcase their impact. His sense of gallows humor appears in other scenes too. That comment could be interpreted two ways. It is meant to be an ad signifiying that customers deserve the comfort and leisure of the model house. At the same time, it is a notice that humanity “deserves” what it gets because of its poor stewardship of the wild, and of the planet as a whole. Again, this isn’t typically a side of Shyamalan that we see at the movies, so it The Happening, especially in its opening sequence, is a refreshing change of pace. Or perhaps it might be considered a development (or evolution) of the dark ideas he has carried in his films, but not really depicted head-on. The early scenes in New York City and Philadelphia give the film the gut-kick that it needs, the visceral punch that keeps viewers on the edge of their seat for much of the running time. 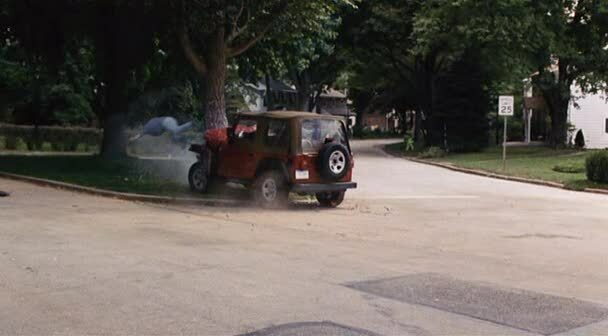 When I talk about an over-the-top or exaggerated response to The Happening, it’s much like the response to the aliens-harmed-by-water subplot of Signs (2002). Specifically, many critics and viewers apparently can’t bring themselves to suspend disbelief in the film’s central idea that plants are rebelling against the human race. Yet it is helpful to remember that a plant revolution or attack on humanity is not a new idea in the genre. Think about classics like Day of the Triffids (1961), for example. The Happening takes on an idea that has been explored in the sci-fi genre for generations (notably in One Step Beyond's "Moment of Hate" and Space:1999's "The Troubled Spirit,” to name two TV series. And as I noted in my intro, the film also qualifies as a revenge of nature horror movie, in the spirit of efforts like Frogs (1972), Kingdom of the Spiders (1977) and Day of the Animals (1977). You know this meme by heart if you love horror movies: man's pollution causes nature to go haywire in response and self-correction. Perhaps the closest antecedent for The Happening is Alfred Hitchcock's masterpiece, The Birds (1963). There, as you will recall, a swarm of birds suddenly and inexplicably went on the attack and nearly took out an entire town. There was no explanation for the battle and the bird assault ended as mysteriously as it began. The Happening provides an explanation (and you can judge whether that’s a good or bad thing, but just imagine if Shyamalan had provided no explanation for the attack…), and also a warning that the attacks will recur until mankind changes his ways. This final warning is the oft-seen "call-to-action" element of revenge of nature films; the warning that we are tampering in God’s domain, or that it’s not nice to fool with Mother Nature. The Happening therefore fits into a pre-existing movie tradition, and is not an exception to tradition or history, as some would have you believe. And what of the film’s science? Similarly, science has proven that plants can emit toxic compounds. Where I would suggest the movie gets into some problems with plausibility is its discussion of evolution. Individual populations don’t evolve, only species evolve over time. If I read the film right, it seems to suggest that plants have just evolved, individually and collectively, to turn on humans, and that doesn’t seem to have any basis in reality, or in our current understanding of science. Similarly, I wonder if there isn't a difference between having your self-preservation switch turned off, and actively trying to kill yourself. In other words, you might have no sense of danger, yet still not stick knitting needles in your throat. But you know, for a Hollywood science fiction film, The Happening isn't especially or egregiously off base. Especially when you accept what passes for science in other major films. Let us not forget that Superman opens a singularity (essentially a black hole) over Metropolis in Man of Steel (2014) but doesn’t have a plan to close it. Oopsy. And Star Trek: Into Darkness (2013) seems to think that cold fusion can be used to transform lava into ice. So, once more, it is telling, I think, that Shyamalan’s films are held to a standard that other genre films clearly are not. Why do we punish an individual filmmaker, working on a much smaller budget, for his creative trespasses, but forgive big franchise moviemakers for theirs? Understanding the response to The Happening hinges on this issue. Is The Happening really that ridiculous? Not all the time. No. But in at least one scene, yeah, it is. I have to admit it. The scene in which Elliot approaches and attempts to soothe a house plant is a perfect storm of dreadfulness. 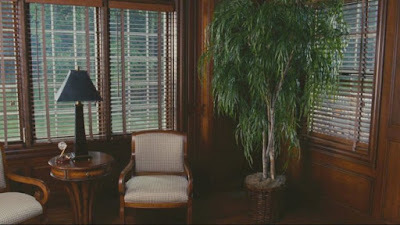 Mark Wahlberg is terrible in this scene, talking calmly and sing-songily to the plant, which turns out to be plastic. When people say the movie is bad, I'm certain that this is the moment they most vividly remember. 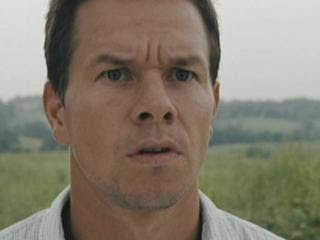 Finally, I feel no shame in acknowledging that for portions of it run, The Happening is, indeed, compelling. Even if you choose to laugh at it, there’s a part of you that will watch, hoping to know where it goes, what it means, and how it will end. The film carries a commendable aura of impending, escalating doom, buttressed by all the gory deaths. Furthermore, the film’s best actor, John Leguizamo -- who should have been Elliot -- portrays a character who sees his end coming from a distance, and his performance is haunting and memorable. His whole emotional subplot works better than Alma's, and we never even meet Julian's wife. We never believe Alma is having an affair -- and she isn't -- and so her story ends happily, with trust in the marriage restored. It feels like a false or manufactured crisis. I’ve received and duly read the memo that we’re all supposed to treat The Happening like a joke, in perpetuity, but let me say this: There’s nothing to be gained by taking that route in this review. There are plenty of reviews which dismiss, bash, and make-fun of the film all over the net. Read and enjoy them! I won’t be a part of that mob mentality. Instead, I'll continue to insist that The Happening is an entertaining and ambitious film that could have been, without a doubt, much, much better. But, The Happening starts strong and ends strong. In terms of the denouement, the film reveals a human race in complete denial, having learned no lessons about its treatment of the planet. Even with characters outrunning the wind, and talking to plastic plants, that close-up look at blind, foolish denialism is as realistic and powerful -- and prophetic? -- as any "monster" in any science fiction film ever made. I think time is being kind to this film. I enjoyed it on release, and that enjoyment has only grown with repeated viewings. I looked up an essay I read some years back, on the film, to link to here because I thought it articulated better than I could, why The Happening is a pretty great film. During my google search, I noticed many 're-evaluations'. I think, at the time, there was a momentum of mob thinking that one sees at times around a film, sometimes even before it is released (like John Carter, or Waterworld) that builds into a frenzy, a gleeful slaughter. I don't know why that is, but once it starts, it is like a wildfire and people try to outdo each other to heap scorn. Shyamalan has, in general, endured years and years of snide condescension about his films, a backlash to his critical darling entry onto the scene. Again, it is a petty reactive hatred that goes far beyond reason. I recall on one website, populated by the precursors to today's holier-than-thou outrage for social justice banshees, a site where withering condemnation rained down on anything that might possibly be construed as racism, and yet when it came to Shyamalan, he was treated as such a laughingstock, that his name was constantly ridiculed and lampooned in a completely infantile racist way, similar to what I remember children would do to the chinese children in my neighbourhood when I was young. Such was the irrationality causing disgust factor in that usually self policing smug community. Anyways, the interesting appreciative essay can be found at the link below, assuming I can comment a link. I don't know when the article is originally from--I read it on the UK version of the site years back, but the american version reprints material.